I used to have more colors of them, like a pretty blue and another version of the yellow, but alas I sold them already! These guys have become very popular items, and with good reason.. they're just so quirky and whimsical you can't help but like them. The mustaches themselves are made from a stencil I cut out of transparency paper. On a side note, Stencilers, Graffiti artists, craft artists like me..This is a VERY helpful hint I picked up somewhere along the way: Use transparency paper (like your teacher used to use with a overhead projector) and an x-acto to cut out your stencils. It's very durable, can be used over and over, and is quickly washable. So the 'stachies get cut out and re-sewn onto another colored piece of felt, one for each side of the keychain. I like having the different color options.. those little black mustaches look great with pretty much any piece of felt I pair it with. The variety is pretty much endless, everyone who get's a 'stache will have a completely unique piece. 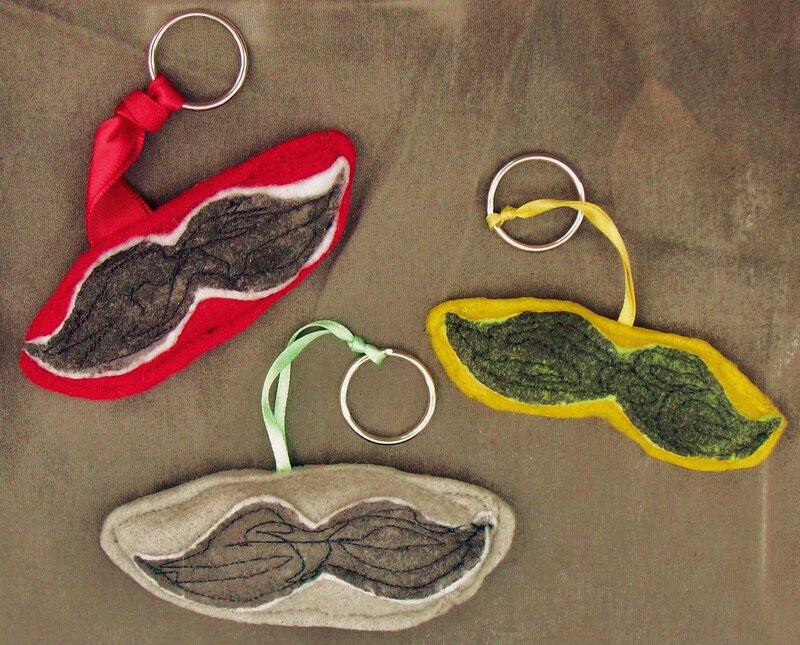 The most unique part about these keychains, though, is how the 'staches are sewn on. Each one is machine freestitched onto the felt. The result is this great little textured design on the moustache. Because the mustaches were stenciled in heavy acrylic paints, it's a lot stiffer than regular felt and the threads just seem to "bite into it" more than usual. Like my other keychains, I've filled these up with store grade sand. In my opinion the sand is so cooler than just stuffing the keychains with regular cotton. The texture becomes completely different and the sand costs half the price of the poly fiber stuffing. I always feel like I'm getting ripped off when I buy that crap. Anyhow, sand is superior. OK I will leave you with a question though. 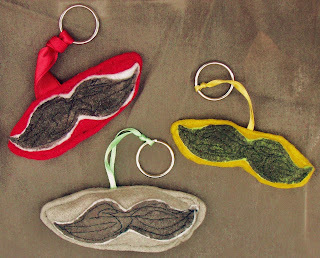 This idea happened to run across my mind while creating thse keychains: What if, instead of stuffing the moustaches and sealing them up, I leave one end open enough for a person to put their finger in? It'd be like a great (funny) portable disguise.. you can wear it on your finger, get it? Just a passing idea..tell me what you think crafties!